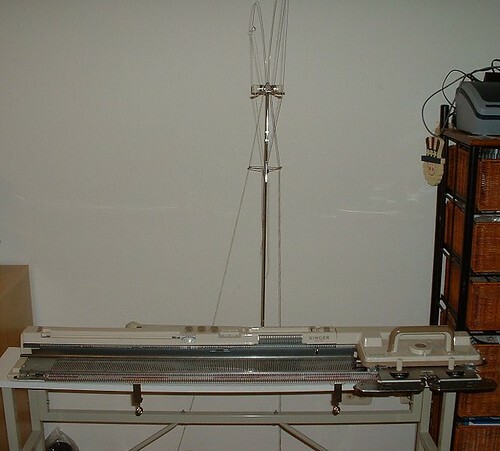 There is weaving arm AW-1 for your knitting machine that semi automates knitweave.You put the two yarns in slots and knit away like you do for fairisle.If you doing multiclour or striped knitweave then it becomes quite painful.Great work on the KM by the way. That is one cool machine! I love all those samples. And, BTW, I nominated you for the Kreative Blogger Award for the really neat things you do and your fantastic garments! Alex, I didn’t know you had a knitting machine: I have two. Before I started sewing/quilting/embroidering again, I was doing machine knitting. I haven’t used my machines for several years but kept them because I want to combine knitting and quilting. There is a KM group that meets in Milton, once a month. I have this same knitting machine and I am trying to get started on it, but I can find no where that it tells you how to oil it. Can you help me? Hello,I was wondering if you could perhaps help me. I have the same machine and there are few things I don’t fully understand about the different functions of the machine and how to use it. Would you have by any chance Photos or videos on internet that I could use to help me using it? Hi Alexandra,I hope you see this incredibly late post. I did not find an email address for you…I am madly in love with the herringbone (card #8)but don’t have a card that will do it.Can you tell me what the name of the set is? I have been hunting around on Google so I can buy this and need help.Thanks!